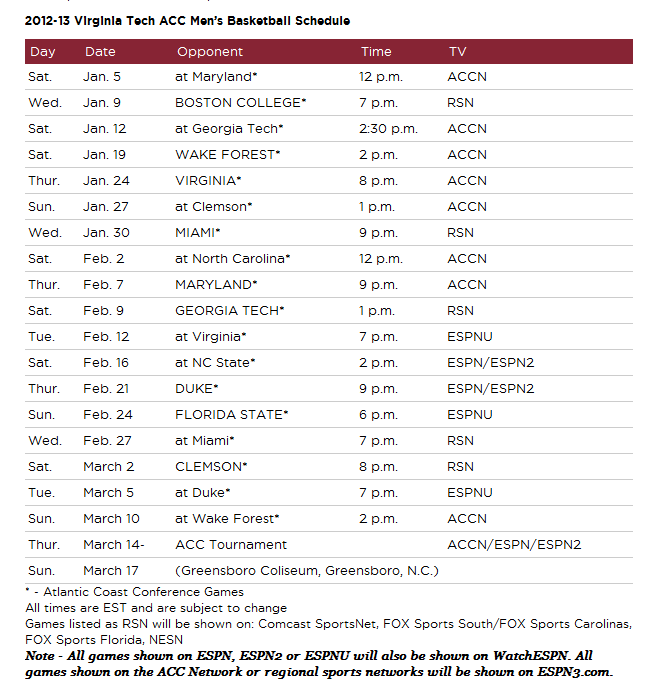 The Virginia Tech Hokies Basketball Program has released the all new 18-game slate of Atlantic Coast Conference games, as part of the 2012-13 Virginia Tech Hokies basketball schedule. The complete 2012-13 schedule will be released at a later date. 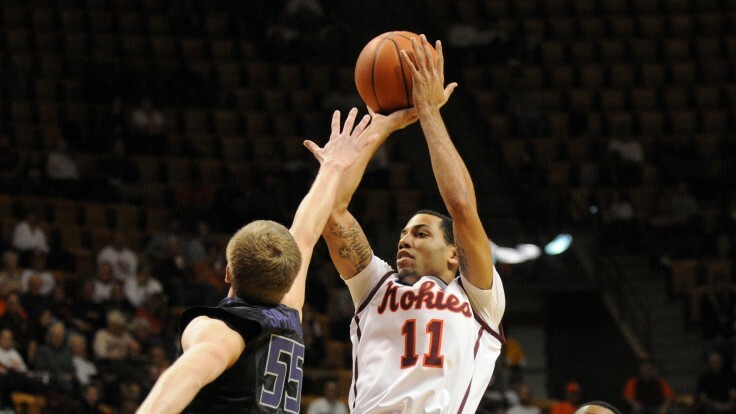 Virginia Tech Hokies basketball, under first-year head coach James Johnson, will open the 2012-13 conference season on Saturday, Jan. 5, as they travel to College Park, Md., to face the University of Maryland at noon on the ACC Network. Tech will open its ACC home slate on Wednesday, Jan. 9, as it hosts Boston College at 7 p.m., in a game to be televised on the regional sports networks. Virginia Tech Hokies will later travel to league opponents Georgia Tech, Clemson, North Carolina, Virginia, NC State, Miami, Duke and Wake Forest. Along with Boston Colllege, Tech will host ACC foes Wake Forest, Virginia, Miami, Maryland, Georgia Tech, Duke, Florida State and Clemson. All 18 of the Virginia Tech Hokies’ ACC games will be televised this season. All games in the ACC Tournament will be televised by either the ACC Network or one of the ESPN family of networks. As a whole, the ACC will have a league-record 188 nationally-televised games. The ACC will once again enjoy tremendous exposure by its broadcast partners. Currently, 88 of the 108 conference games (81.5 percent) will be televised on an ESPN network, CBS or carried on the ACC Network. Twenty-nine games will be shown on ESPN/ESPN2, 20 on ESPNU and three on CBS. The ACC Network will broadcast 36 ACC games while the league’s Regional Sports Networks (Comcast SportsNet, FOX Sports South/FOX Sports Carolinas, FOX Sports Florida, NESN) will carry 20 contests. The North Carolina at Duke game on February 13 will be broadcast by both ESPN and the ACC Network. In addition, 85 of the games will also be made available on ESPN3. All games, with the exception of the three CBS telecasts, will be available through WatchESPN, accessible online at WatchESPN.com and through smartphones and tablets via the WatchESPN app to fans who receive their video subscription from an affiliated provider.